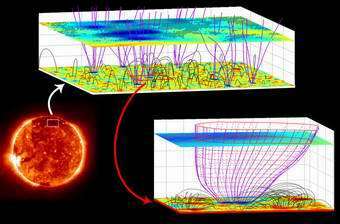 A Chinese-German team of scientists have identified the magnetic structures in the solar corona where the fast solar wind originates. Using images and Doppler maps from the Solar Ultraviolet Measurements of Emitted Radiation (SUMER) spectrometer and magnetograms delivered by the Michelson Doppler Imager (MDI) on the space-based Solar and Heliospheric Observatory (SOHO) of ESA and NASA, they observed solar wind flowing from funnel-shaped magnetic fields which are anchored in the lanes of the magnetic network near the surface of the Sun. These observations are presented in the April 22 issue of Science magazine. The research leads to a better understanding of the magnetic nature of the sources of the solar wind, a stream of tenuous and hot plasma (electrically conductive gas) that affects the Earth's space environment. The solar wind consists of protons, alpha particles (two-fold ionized helium), heavy ions and electrons flowing from the surface of the Sun with speeds ranging from 300 to 800 km/s. The heavy ions in the coronal source regions emit radiation at certain ultraviolet wavelengths. When they flow towards Earth, as they do when tracing the nascent solar wind, the wavelengths of the ultraviolet emission become shorter, a phenomenon called the Doppler effect, which is well known in its acoustic variant, for example, from the change in tone of the horn of a police car while approaching to or receding from the listener. In the solar case, plasma motion towards us, which means away from the solar surface, is detected as blue shift in the ultraviolet spectrum, and thus can be used to identify the beginning of the solar wind outflow. A SUMER ultraviolet spectrum is similar to what is seen when a prism separates white light into a rainbow of distinct colors. The ultraviolet radiation is however invisible to the human eye and cannot penetrate the Earth's atmosphere. By analyzing ultraviolet emission obtained by SUMER on the space observatory SOHO from space, solar physicists can learn a great deal about the Sun and infer the gas temperature, chemical composition, and motion in the various atmospheric layers. "The fine magnetic structure of the source region of solar wind has remained elusive" said first author Prof. Chuanyi Tu, from the Department of Geophysics of the Peking University in Beijing, China. "For many years, solar and space physicists have observed fast solar wind streams coming from coronal regions with open magnetic field lines and low light intensity, the so called coronal holes. However, only by combining complex observations from SOHO in a novel way have we been able to infer the properties of the sources inside coronal holes. The fast solar wind seems to originate in coronal funnels with a speed of about 10 km/s at a height of 20,000 kilometers above the photosphere". "The fast solar wind starts to flow out from the top of funnels in coronal holes with a flow speed of about 10 km/s", states Prof. Tu. "This outflow is seen as large patches in Doppler blue shift (hatched areas in the above figure) of a spectral line emitted by Ne+7 ions at a temperature of 600,000 Kelvin, which can be used as a good tracer for the hot plasma flow. Through a comparison with the magnetic field, as extrapolated from the photosphere by means of the MDI magnetic data, we found that the blue-shift pattern of this line correlates best with the open field structures at 20,000 km." The SUMER spectrometer scrutinized the sources of the solar wind by observing ultraviolet radiation coming from a large area of the northern polar region of the Sun. "The clear identification of the detailed magnetic structure of the source, now being revealed as coronal funnels, and the determination of the release height and initial speed of the solar wind are important steps in solving the problems of mass supply and basic acceleration. We can now focus our attention on studying further plasma conditions and physical processes that occur in the expanding coronal funnels and in their narrow necks anchored in the magnetic network", says Prof. Eckart Marsch, co-author of the Science paper. Solving the nature and origin of the solar wind is one of the main goals for which SOHO was designed. It has long been known to the astronomical community that the fast solar wind comes from coronal holes. What is new here is the discovery that these flows start in coronal funnels, which have their source located at the edges of the magnetic network. Just below the surface of the Sun there are large convection cells. Each cell has magnetic fields associated with it, which are concentrated in the network lanes by magneto-convection, where the funnel necks are anchored. The plasma, while still being confined in small loops, is brought by convection to the funnels and then released there, like a bucket of water is emptied into an open water channel. "Previously it was believed that the fast solar wind originates on any given open field line in the ionization layer of the hydrogen atom slightly above the photosphere", says Prof. Marsch, "However, the low Doppler shift of an emission line from carbon ions shows that bulk outflow has not yet occurred at a height of 5,000 km. The solar wind plasma is now considered to be supplied by plasma stemming from the many small magnetic loops, with only a few thousand kilometers in height, crowding the funnel. Through magnetic reconnection plasma is fed from all sides to the funnel, where it may be accelerated and finally form the solar wind." The SUMER instrument was built under the leadership of Dr. Klaus Wilhelm, who is also a co-author of the paper, at the Max Planck Institute for Solar System Research (formerly Max Planck Institute for Aeronomy) in Lindau, Germany, with key contributions from the Institut d'Astrophysique Spatiale in Orsay, France, the NASA Goddard Space Flight Center in Greenbelt, Maryland,the University of California in Berkeley, and with financial support from German, French, USA and Swiss national agencies. SOHO has been operating for almost ten years at a special vantage point in space 1.5 milion kilometers from the Earth, on the sunward side of the Earth. SOHO is a project of international collaboration between the European Space Agency and NASA. It was launched on an Atlas II-AS rocket from NASA's Kennedy Space Center, Florida, in December 1995 and is operated from the Goddard Space Flight Center.